“But what about…?” Anyone in leadership who has launched a change initiative has almost certainly heard this question posed by a staff member. It is a common response from those who are hesitant to embrace change. Asking staff members to make a pedagogical shift to creating a cooperative classroom will almost certainly result in some members of your organization raising this question. Effective communicators are those who have developed certain skill sets (i.e., verbal and nonverbal skills). The only way children who lack such skills are going to improve is through practice. Structures give students—all students—the repetitions they need to improve their communication skill sets. Encourage educators to think long term. If educators would start ensuring frequent, structured interaction experiences for all children beginning at the age of 5, imagine the number repetitions students would receive by the time they reached high school. The reason some students—especially secondary students—experience anxiety in their communications with others is they have not been afforded ample repetitions in traditional classrooms over a period of many years; thus, their skill sets are lacking. Avoiding interaction will not improve communication skills; practice is the answer. Social skills will also only improve through repetitive practice. Teach, model, reinforce, and practice—we follow this pattern when teaching students academic content. Why would we avoid this sequence when dealing with social skills? Students will never improve socially by being kept in passive, isolated settings. For social skills to improve, students must be placed in active, interactive environments. Unfortunately, we have been taught through the years to do just the opposite when social skills problems surface (i.e., isolate peers from one another). 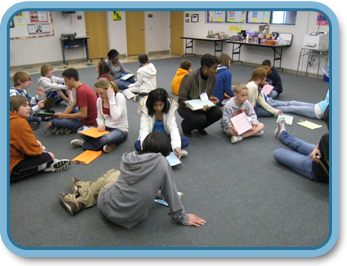 Kagan Structures provide a structured setting for students to acquire skills that will enable them to effectively collaborate with others. To develop interpersonal skill sets, encourage teachers to begin using structures with easy content (e.g., teambuilding, classbuilding for fun). All kids, including those with special challenges, can typically talk about fun, easy, non-academic content. Too often teachers want to immediately begin using structures with academic content; they forget about the importance of classbuilding and teambuilding. Avoid using structures with academic issues in the initial stages of implementation. Talking about enjoyable, stress-free topics will help children develop confidence and skills so they can tackle more difficult academic content later. Students who are anxious when working with others are much more likely to make an effort in cooperative classrooms because such settings are safe places for the brain. If teachers will commit to teambuilding and classbuilding as we advocate in training, relationships will grow and a positive climate will be created, making it safer for students to take intellectual risks. Additionally, answering questions in a Teacher A setting (i.e., answering questions in front of 25 of their peers) can be very intimidating for some children. 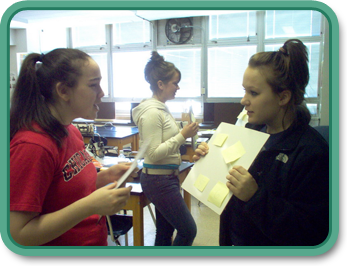 In a Teacher C (cooperative learning) classroom, students only respond to one person (shoulder, face, or random partner) or to a team of three others. Such an environment is safe, especially when relationships are strong and students have begun experiencing the benefits of positive interdependence. Safe settings mean the amygdala will fire far less frequently, and anxiety will be greatly reduced. Occasionally, educators will note the challenges of timed structures. Not every structure is timed; in fact, very few of them are. If teachers note that timed structures are creating apprehension, suggest some of the ideas noted below. Provide more think time (30 seconds or more). Have students write down their answers during think time so they can use their notes when responding. Shorten the length of response time (15 seconds or less) until students develop skills to fill longer time increments. Direct the listener on what to do in order to keep his/her partner talking (e.g., encourage each other, ask questions of the one sharing). Avoid using timed structures on a frequent basis until students develop stronger skill sets. “But what about…?” It is a fair question. Don’t become frustrated with staff who pose this question. While it may signify resistance to change, more often than not, I have found it to be a sincere effort to think about the challenges associated with shifting from passive to interactive environments. Answer their questions; be forthright with them and provide them with sound rationale. If you are confronted with questions and are unsure how to respond, please do not hesitate contacting us. We will do our very best to provide you with support so that you can lead your staff to embrace the premises foundational to cooperative classrooms.